The Scottish Fold, was originally a spontaneous mutation of farm cats in its native Scotland, and has been further established through breeding with American and British Shorthairs. The folded ears which give a winsome appearance of a tight little cap and the resulting sad expression are the hallmarks of the Scottish Fold, which is becoming increasingly popular, although officially banned in its native county. The ears can show many degrees of tightness of the folded ear with the smaller tighter fold being the kind preferred in the show rings. 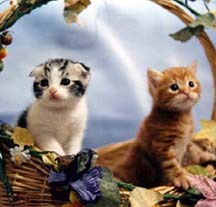 To make sure that no genetic problems such as shortening of the tail, thickened limbs, problems with gait and other structural abnormalities are produced, good breeders will not attempt a fold to fold breeding but prefer to use either a straight eared Fold or cross to American or British Shorthairs. Scottish Folds are a medium sized cat with a rounded appearance, and huge, expressive eyes. The short dense coat comes in a broad range of colours and requires minimal care. The breed has a sweet, calm, gentle nature. Folds adapt well to most environments but are likely to adopt one member of the family as "his person". which are held by the individual photographers.